Virat Kohli and Anushka Sharma have succeeded in making the wedding celebrations the most memorable time of their lives. Now, latest pictures of Virushka’s post-wedding are making rounds over the internet. Indian skipper Virat Kohli and Bollywood actress Anushka Sharma tied knot and changed their relationship status on December 11. The couple have succeeded in making the wedding celebrations the most memorable time of their lives. Now, latest pictures of Virushka’s post-wedding are making rounds over the internet. In the recent pictures, the actress is wearing full sleeved gown and the cricketer is seen in all-black outfit. Until December 11, the Virat Kohli and Anushka Sharma left no stone unturned in keeping the wedding a secret. However, the wedding planners, photographers, fashion stylists, hairstylists, make-up artists and wedding designer shared interesting moments from the event after the official announcement. 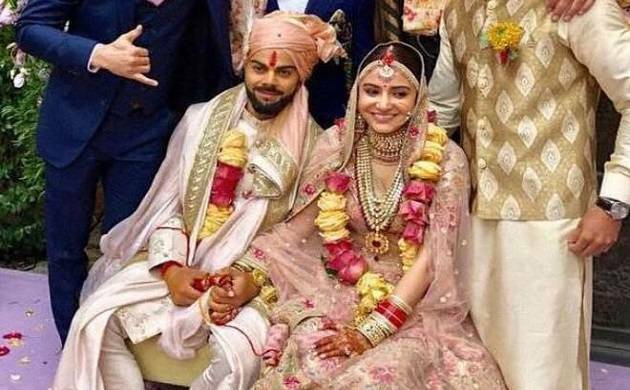 Anushka and Virat shared the news of their wedding on their respective social media handles along pictures of the wedding ceremony and wrote, “Today we have promised each other to be bound in love forever. We are truly blessed to share the news with you. This beautiful day will be made more special with the love and support of our family of fans & well-wishers. Thank you for being such an important part of our journey’’.